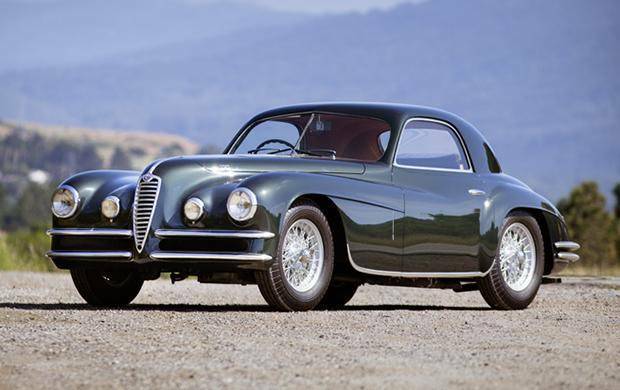 The 1950 Alfa Romeo 6C 2500 SS Coupe is an example of the Italian automotive manufacturer’s early post-war efforts. Like most vehicles produced shortly after World War II, the 6C 2500’s underpinnings dated prior to the war while the various coachwork and chassis were post-war efforts. The 2500 SS or “Super Sport” was the top-of-the-line variant of the 6C series, featuring a 106.3-inch wheelbase that was significantly shorter than the Turismo and Sport variants. Several bespoke coachmakers including Ghia, and Carrozzeria Touring created unique coupe bodies for the 6C throughout its production. For instance, Carrozzeria Touring produced 36 of its Villa d’Este Coupé bodies. These bodies are also considered one of the last ever hand-made Alfa Romeo cars. The Ghia Supergioiello coupe body was the rarest of the lot, with only four built. Out of the four bodies produced by Ghia, only one featured an advanced post-war tubular chassis designed by Gilberto Columbo and manufactured by Gilco. Columbo would go on to design chassis for Maserati and Ferrari throughout the rest of the 1950s. Underneath, the 1950 Alfa Romeo 6C 2500 SS Coupe featured a 2.5-liter inline six-cylinder engine. Fitted with triple Weber carburetors for greater performance, the 2.5-liter engine produced 110 horsepower. A four-speed manual gearbox helped channel this power to the rear wheels. The 6C 2500 SS Coupe featured excellent handling and overall performance for the post-war era, thanks in large part to its independent front and rear suspension. Four wheel hydraulic drum brakes provided adequate stopping power for the era.